FedEx flight 630 departed Seattle (SEA) at 05:58 PDT for a cargo flight to Memphis (MEM). Approaching Memphis, air traffic control vectored the flight onto the runway 18R final approach course. The flight was then cleared for a visual approach to runway 18R. The visual approach was initially flown with the autopilot engaged and coupled to the ILS. The airplane was established on the final approach course about 9 miles north of the airport. About 1,600 feet altitude, the airplane was configured for a flaps 35 landing and the approach was stable passing through 1,000 feet. The crew reported that gusty winds at altitude reduced to near calm, or a light tailwind, by this point. The crew reported the final approach segment was smooth, and the first officer disengaged the autopilot at approximately 400 feet and manually flew the airplane appropriate to conditions. He noted that some crosswind correction was still required at approximately 50 feet, when the electronic altitude callout cadence began. He stated that the flare and touchdown were normal, with crosswind correction. The airplane landed with 122 knots airspeed and a descent rate of approximately 2 to 3 feet per second. The touchdown was within design limits for the main landing gear. Approximately seven seconds after touchdown, the left hand main landing gear began to fail (collapse). The first officer reported that while actuating the thrust reversers, he started to apply brakes and immediately experienced "a severe and violent shudder" much more violent than he had ever experienced. He released the brakes, and the shuddering continued, but less violently, and he then reapplied brakes and the shuddering increased again. At that time, the airplane rolled and yawed to the left. The first officer held full right yoke and full right rudder in an effort to counter the turning and listing. The captain tried to assist by using the tiller to keep the airplane on the runway. The airplane continued yawing and sliding to the left and came to rest close to taxiway M4. Prior to the airplane stopping, a fire ignited beneath the left engine nacelle and spread to the inner portion of the left wing. The captain activated the left engine fire extinguisher and began shutting down the airplane. Airport fire crews responded almost immediately, and the fire was extinguished prior to spreading further. The crew and nonrevenue pilot evacuated the airplane via the R1 door and slide. The crew reported that due to the leftward list of the airplane, the slide was at a steeper angle than normal. 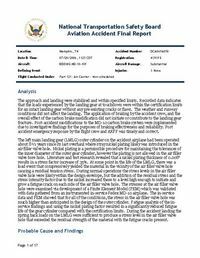 PROBABLE CAUSE: "The failure of the left main landing gear due to fatigue cracking in the air filler valve hole on the aft side of the landing gear. The fatigue cracking occurred due to the presence of stray nickel plating in the air filler valve hole. Contributing to this was the inadequate maintenance procedures to prevent nickel plating from entering the air filler valve hole during overhaul." Distance from Seattle/Tacoma International Airport, WA to Memphis International Airport, TN as the crow flies is 2984 km (1865 miles).